The Top Picks for May will feature films about mothers. 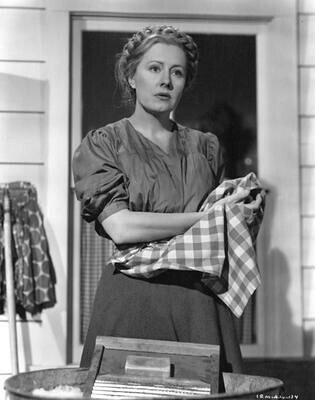 This week's movie is I Remember Mama (1948), starring Irene Dunne as a selfless Norwegian immigrant who sacrifices for her children. Director George Stevens' 1948 classic, I Remember Mama, is an excellent choice for a Mother's Day film. Irene Dunne gives a wonderful performance as the matriarch of a large Norwegian family, the Hansons, who live in genteel poverty in turn of the century San Francisco. TCM will air I Remember Mama as part of its Essentials series at 8 p.m. Saturday. I Remember Mama begins with the Hanson's eldest daughter, Katrin (Barbara Bel Geddes), reminiscing about her childhood. Katrin is now a successful writer, but she fondly recalls growing up in a small house with her parents, two sisters, and one brother and an array of colorful aunts, uncles, and cousins stopping by to visit. "First and foremost, I remember Mama," Katrin says in a voice-over narration that sets the nostalgic tone for the rest of the film . I Remember Mama doesn't have a single plot line that drives the film. Instead, it is a series of vignettes, some humorous, some tragic, about daily life for the Hansons. Mama (her actual first name is Marta, but even her husband calls her Mama) is at the center of each story in some way, whether she is attempting to chloroform a cat (believe it or not, the film's best sequence) or masquerading as a cleaning woman so she can sneak into a hospital to sing a lullaby to her youngest daughter. 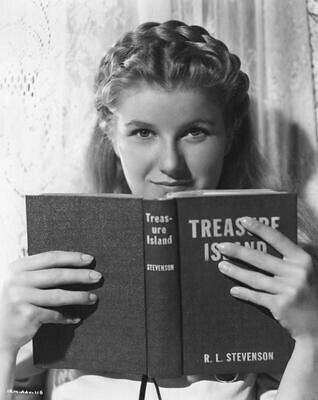 Barbara Bel Geddes played bookworm Katrin Hanson in I Remember Mama (1948). Irene Dunne gives an understated, but commanding performance as a woman who scrimps and saves the family's meager income so her children can have a better life. It's difficult to portray virtues like thriftiness and hard-work on film without turning off the audience, but Dunne, whose greatest onscreen asset is her warmth and humor, does an admirable job, despite being saddled with an unfortunate accent. I Remember Mama is full of great performances, especially from Oscar Homolka as blustering Uncle Chris, and Ellen Corby as a maiden aunt who longs to marry the bumbling Mr. Thorkelson (Edgar Bergen). Dunne, Corby, Bel Geddes, and Homolka were all nominated for Oscars, and Corby won the a Golden Globe for best supporting actress. 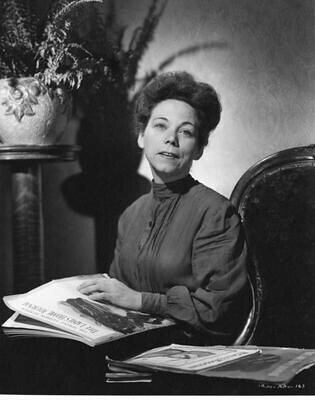 Ellen Corby earned a Best Supporting Actress Oscar nomination for playing love-starved Aunt Trina in I Remember Mama (1948). I Remember Mama is one of the most unusual films in Stevens' eclectic career. He was the master of many genres, including the Western (Shane), action-adventure (Gunga Din), and romance (A Place in the Sun). Stevens acquired the rights to John Van Druten's 1944 play (notable for the Broadway debut of Marlon Brando as the Hanson's son), which was based on a 1942 novel, Mama's Bank Account, by Kathryn Forbes. She based the book on the experiences of her immigrant grandparents. 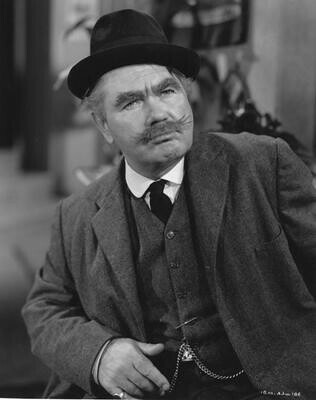 Oscar Homolka as blustering Uncle Chris in I Remember Mama (1948). I Remember Mama's meandering style, not to mention the heavy Scandinavian accents, can be off-putting for modern viewers, but it is worth investing time and attention in one of the gentlest films in Stevens' long career. Stevens served in World War II, heading a film unit in the Army Signal Corps. During his service, he documented the atrocities in Nazi concentration camps, even preparing his footage for evidence in the Nuremberg Trials, which prosecuted some of those responsible for the Holocaust. 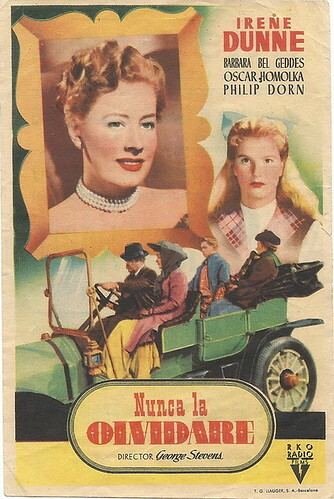 A Spanish language poster for I Remember Mama (1948). The title means I will never forget her. I can't help but think that I Remember Mama was Stevens' way of dealing with what he experienced in Germany. Instead of meticulously documenting the horrors of war, he is turning his attention to the goodness and kindness of ordinary people. Mama lives by a rigid moral code, but she doesn't let her beliefs shape her behavior towards others. Mama is the only member of the family who treats Uncle Chris' common-law wife, Jessie (Barbara O'Neil), with kindness. Jessie is such a pariah in the family that she has to sit outside during family gatherings. 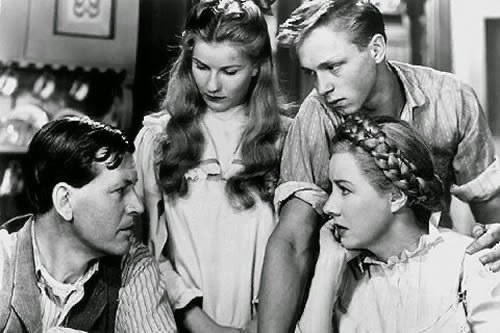 Philip Dorn (left), Barbara Bel Geddes, Steve Brown, and Irene Dunne count the family savings in I Remember Mama (1948). I Remember Mama is also about the power of memory and how it shapes our lives. Katrin narrates the story as an older woman, and her remembrances of Mama certainly have an affect on her adult behavior. Katrin looks, acts, and dresses very much like Mama, which certainly seems out of place for the late 1940s. In many ways, Katrin seems more comfortable living in the past with her treasured memories of Mama. It's Katrin's way -- and I think by extension Stevens' way -- of finding a moral compass in an uncertain postwar world. I Remember Mama is available on DVD and video on demand.